Life in a Typewriter Shop: More Beautiful Repairs Coming In. These machines are so much fun to type on. 1929 Royal "P" Model. Love this color of blue. The colors from these 1929 models just glow! These linespace counters probably charged customers by the line. 1940 burgundy Royal Quiet de Luxe. I just don't see many of these other than black. Late 30's Corona Junior Model S looks spectacular. The Model S denotes that it has a backspace key. Sorry to hear about your back. I hope everything heals fine. Those are some great looking typewriters. I really like the typeface. Thanks for sharing the poster and fliers. Nice machines indeed, I think I saw that alligator Royal on ebay. 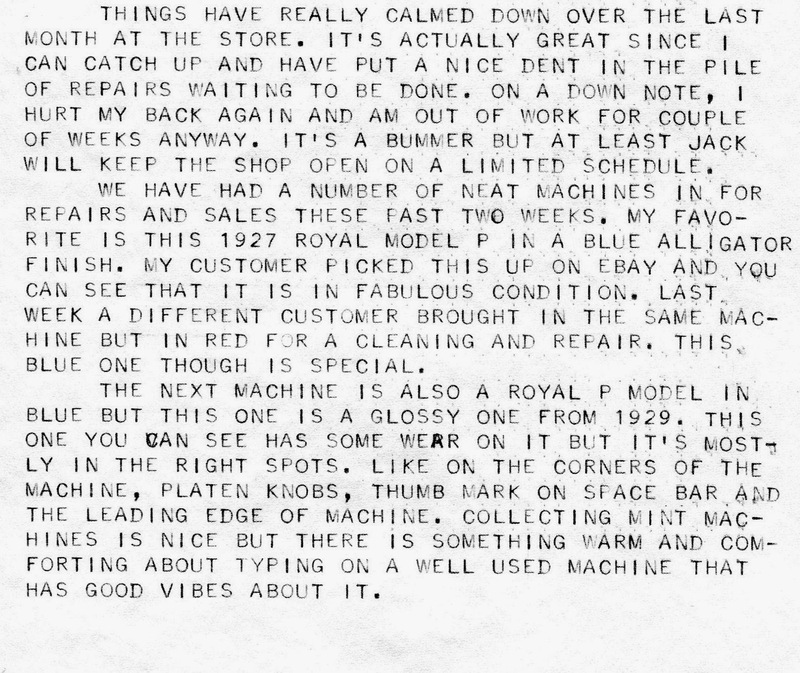 So true that there is something warm about typing on a well used machine with good vibes. When the imperfections are not too distracting, they do lend character. Hope your back would be on the mend quick! I love how the ad shows the Olympia SFS can be put in a desk drawer. Hope you feel better soon, Tom. Storing the typewriter sideways on the bookshelf? Never thought of that!! Love it. So sorry about your back; back problems are so debilitating. 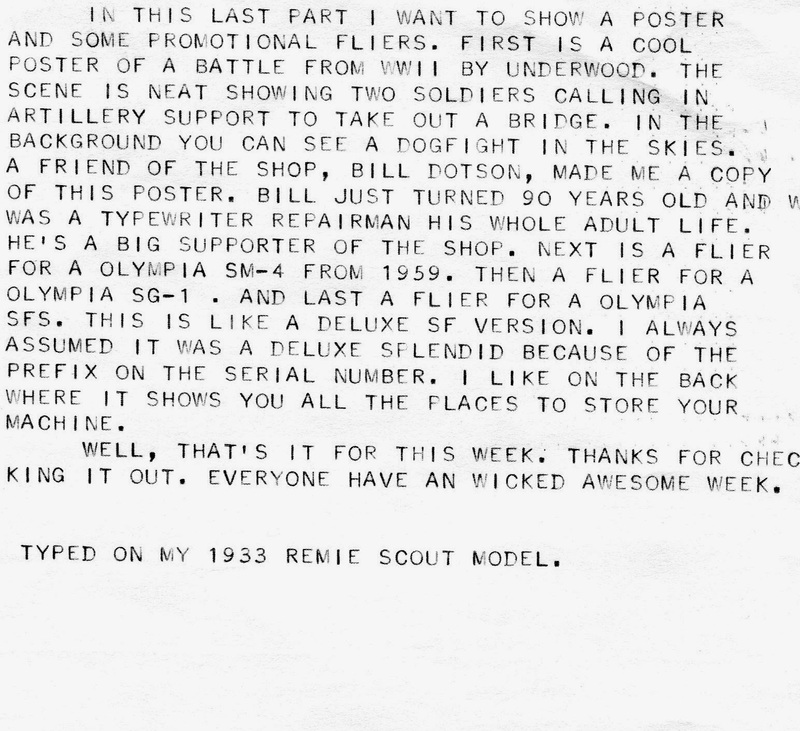 Bill- The type on the Remie Scout is a gothic style caps only type. I like it too. Ton- Thanks for your generous comments. I type on hundreds and hundreds of machines every year and I really get a feel for each one. I especially like the well used ones. ZetiX- I just finished the Corona and haven't shown it to anyone yet in the shop. Most of the time these kinds of machines are sold the same day I get them in. bibliomichelle- I thought that was the coolest part of the ad too. I liked putting it in a bookshelve like it was a book. Janet- Thanks for your grear comments Janet. I wonder how many people will now put their SF in a bookshelf. Tom, I hope that you feel better. Jack told me that you were laid up. So sorry! Get well soon, my friend. I wanted to show you the Olivetti L22 I scored on-line, in its original box, original packaging, still had the rubber stoppers on the carriage and a piece holding all of the keys in place, never used, all the brushes, instruction book, cover. Well, now it has been used! But when I wanted to show you, it was dead stock! The color is amazing. I'll show you when you get better. Also, I acquired this Adler that committed suicide in shipment breaking both roller feed knobs. I think that the rest of it is ok. The cool thing about it is that the font is cubic elite. Maybe you can fix it for me??? It may be a reach! We'll see. Well, I'm sure everyone misses you. I have no one else to geek out to except for Helen! Rest up. You're needed. Good stuff! The line counter on the Remington is really interesting and I would never have guessed its purpose. Hello Tom, Like everyone else, I'm also sorry to hear about your back. A legacy of struggling through office doors and up stairs carrying heavy machines I'm guessing ! Re: the Olympia SFS, it looks very like an early Olympia Splendid 33 without the badge. The original SF had a wire bail fold over paper rest, wheras the Spl 33 had the fold up paper rest. The pop-up paper rest and bi-colour ribbon appeared later on the Spl 66. The short-lived Spl 99 was the first in the range to have the clear plastic margin scale, which subsequently spread to the other machines in the range together with the plastic linescales. Being nearer to Germany here in England, I imagine that I see more of these than you do. In fact it is my favourite flat portable. My personal machine (which I have had for over 40 years) is another variant - the 1960's DeLuxe ! Oooohhh! I don't know with one I like best, the blue one or the alligator blue one. There both very pretty. Sorry to read you hurt your back again. Hope you can back to your normal rhythm soon. I collect red typewriters (and one pink one). They are on display at the Norfolk (MA) Public Library through the end of the week! I have a red and a pink Royal Quiet DeLuxe. Tim- Thanks for your good wishes! Sorry I missed to today at the shop. I can only go a couple of hours a day until I get fixed up. Next time, bring in the L-22. Richard- Thanks Richard. 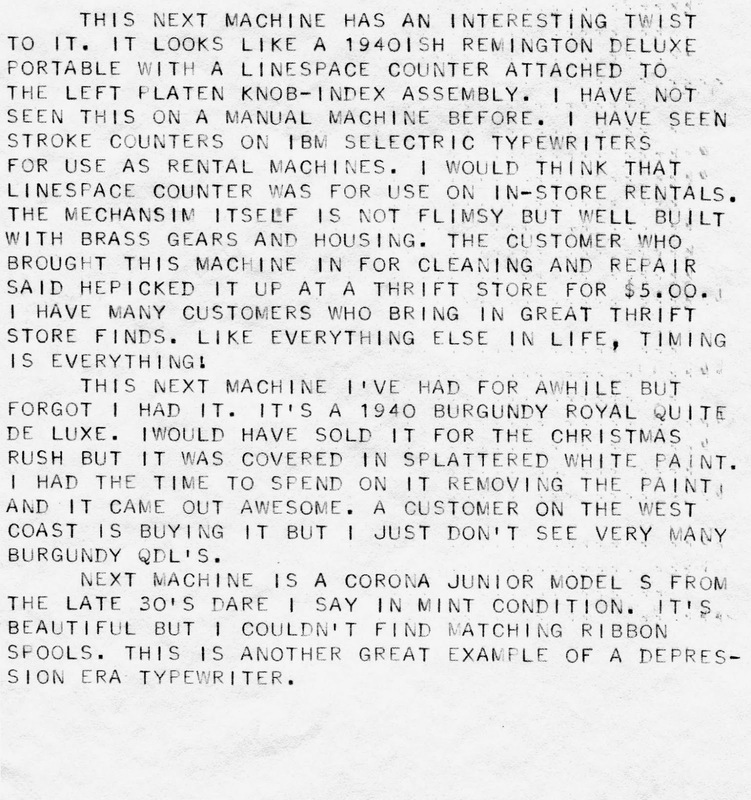 It's always extra cool to see something new on the typewriter front. Tom- I do see a fair amount of Olympia SFS, Splendids and SF's.I always assumed the SFS was just a more deluxe version of the Splendid. The SF all have a prefix of 05 before the serial number. The Splendid and the SFS all have a prefix of 95 before the serial number. I had a mint condition Splendid 99 in script that I gave away to a friend a few years ago. I'm kind of wishing I had it back now because I loved that machine. Spiderwebz- Thanks for your comments. Boy they sure made really cool colors back in the day. Marissa- Thanks for your comments. Red machines are wicked cool. Royal Quiet de Luxe made a really good red and pink machine. I only have three red machines in my home, a red 1966 Selectric 1, a 1960 cherry red Olympia Splendid and a red 1929 Royal "P" Model.